During Apple's quarterly financial results call for the third fiscal quarter of 2016, CEO Tim Cook shed more light on Apple Pay's adoption and growth with purchasers and retailers. Cook noted that Apple Pay's monthly users are up over 400 percent year over year. Out of the nine markets in which Apple Pay is live, more than half of the service's transaction volume is coming from outside the U.S.
Additionally, Cook noted that three million retailers now accept Apple Pay in the U.S. Worldwide, there are more than 11 million points of sale across all participating Apple Pay countries. Retailers are telling Apple that three out of four contactless payments in the U.S. are being made with Apple Pay, instead of competing services Android Pay or Samsung Pay. Answering a question from Gene Munster, Cook specified Apple Pay revenues as less about profits, and more about a "great feature for our customers" with iPhones. Cook said that while growth is astronomical, the base is relatively very small, as compared to the overall Apple user base. Apple has yet to break out concrete numbers of regular users of the service. Analysts believe that U.S. Apple Pay transactions accounted for most of an estimated $10.9 billion in transactions in 2015. Only four countries had official Apple Pay support in 2015. 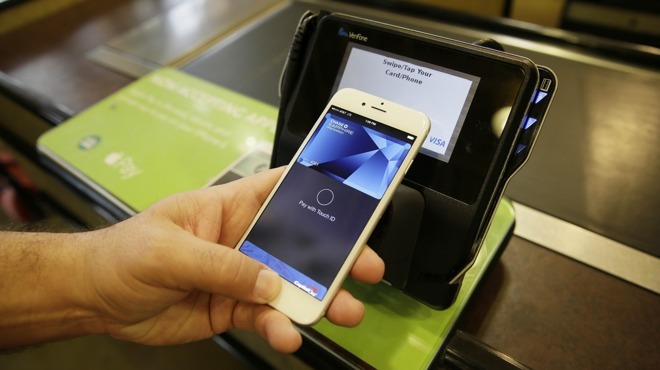 After an October 2014 U.S. launch, the Apple Pay service expanded to the U.K., Canada, and Australia. In 2016, Apple Pay launched in China, Singapore, Switzerland, France, and Hong Kong. Revenue from Apple Pay contributes to the "services" category of the company's financial report. Services came in at $6 billion, up 20 percent from the year-ago quarter. Services count for about 11 percent of Apple's overall revenue, with Cook claiming that if it was separately accounted for, would qualify for a Fortune 100 company at some point in 2017.